I had a plan today and I intended to stick with it -- 5 miles on the Bethpage State Park bike path, first thing in the morning. I checked the weather and saw that the temperature was in the high 30's, so I put on some long pants and a couple of top layers and headed to Bethpage. I wore my Brooks Adrenalins because I wanted more thermal protection than the Hattori's provide and, frankly, I'm just not loving the Mirages on pavement right now. When I arrived at the park I was confronted with a locked gate and a sign that said "Winter sports are prohibited at this point." Harrumph!! That was disappointing and after snapping the above picture, I turned around and headed back toward home. I was all dressed up with nowhere to run, but I figured I'd think of something along the way. 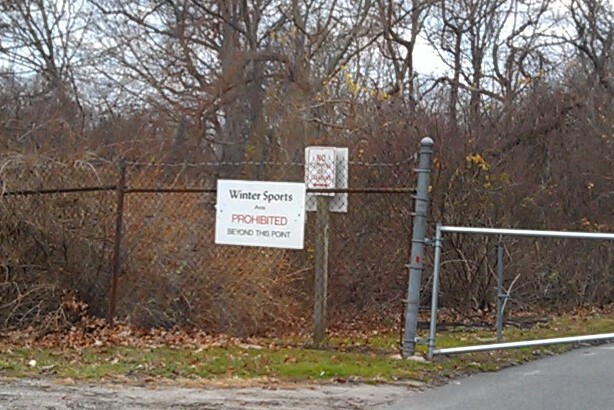 When I reached my exit I decided to head over to Stillwell, which I knew would still be be open to those participating in "winter sports." I parked close to Southwood's Road that put me as far away as possible from the trail head. I thought it would be good to have some extra distance coming and going. By the time I crossed over from pavement to trail, I'd already covered more than a quarter mile and I followed my usual route into the woods. Despite not being trail shoes, the Brooks do a credible job on dirt, sand and small rocks and that was all I was taking on this morning. My run was pleasant but unremarkable and I didn't encounter another person until I was on my last loop around the big field. It was there that I passed three runners coming from the other direction. I continued west and then south, until I reached the path that led to the trail head. As I came onto that path I saw the three runners from before, who had come to the same point from the opposite side. Since I ended up slightly ahead of these runners, I felt pressured to maintain a lead. Fortunately, they weren't running too fast, but they weren't dogging it either. When we reached the paved drive I increased my speed to maintain my position. I liked having a reason to run fast and the Adrenalins felt as responsive as always. I averaged in the low 8:00 range for that last section and was more than happy when I reached my car. I covered 10.5 miles this weekend, a little short of my goal, but still respectable. I feel like I'm running well right now. Not a lot of speed, but it's there when I need it.